Ulma Packaging, one of the country’s leading suppliers of packaging equipment for the whole fresh bird wrapping market, has in conjunction with a major industry processor launched an exciting new packaging format for poultry that offers attractive presentation, product protection and exceptional hygiene standards by removing human contact with the uncooked item from the supermarket shelf to oven. 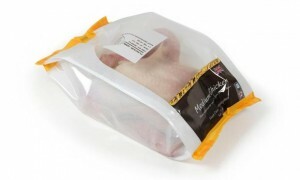 The company, which offers poultry processors one of the biggest ranges of packaging solution choices available anywhere in the UK, adapted a horizontal flowrapper, the Artic Q, to create an enhanced version of the pillow pack style bag, suitable for a whole chicken that can go straight into an oven. This latest innovative machinery delivers an ovenable polyester film in quad pack format, which also comes with complete modified atmosphere packaging (MAP) for extended shelf-life. It was designed by Ulma following an approach from a customer for a cost-effective, high value cook-in-the-bag solution for fresh whole chicken. Ulma’s Artic Quad flowrapper is state-of-the-art equipment for fresh poultry wrapping. Its high speed long dwell sealing head, characterised by an ‘oval’ motion profile in the jaw, assures perfectly hermetically sealed packs at high production speeds. Once the chicken is wrapped, with or without a tray, the machine profiles and seals film on four corners for a box-like effect, adding value for suppliers by allowing printing on four sides of the pack and increasing the visibility of the product to shoppers. The strength of the hermetic seal created by the Artic Quad flowrapper protects the integrity of the bag, keeping juices from seeping out and contaminating surfaces and other products. The spin off for consumers is that they can pop the chicken into the oven for cooking without having to handle the raw poultry.It is no surprise Ulma was chosen to supply the equipment considering its impressive range of flowrappers for shrink, stretch shrink, barrier shrink, laminate and ovenable pillow packs. Ulma also has the latest in thermoforming skin packing technology, tray sealers for fresh fillets and portions in MAP and vertical baggers for wrapping frozen portions. In addition to totally integrated applications, Ulma also boasts complete, automated in-line solutions for processors, putting it at the forefront of improving packaging formats within the poultry industry, influencing market trends for shrinkable stretch film, laminates and guaranteed leak proof barrier shrink films.